A worker builds part of the Mariner East pipeline, which is at the heart of a controversy over Sunoco's attempt to use eminent domain and skirt local zoning laws. NORTH STRABANE, Pa. — For more than a decade, the country around Ronald and Sallie Cox’s home, 25 miles south of Pittsburgh, has been an unchanging landscape of rolling green foothills. Sitting atop a modest promontory, their property is ringed on three sides by a border of woodland, and to the east, the ground slopes down into a neighbor’s horse paddocks. The Coxes built their home in 2001, and they’ve paid to maintain their enviable slice of exurban Pennsylvania. When Ronald, a financial adviser at Prudential, grew fed up with the way his wraparound backyard deck shifted every time he sat down for an evening drink, he spent around $30,000 to rip it out and replace it. You could probably land a plane on the new one, he jokes. But in late 2012, someone bothered the Coxes. A representative of oil and gas transporter Sunoco Logistics Partners — a “landsman” sent by the company to scout and buy access to their property — came to their front door and told them that Sunoco was going to dig a pipeline under their woods. “And I went: ‘No you’re not,’” Cox says. I kind of thought, ‘If we resist enough, they’re going to go away.’ But they didn’t. After he refused, a lawyer for Sunoco sent a letter that said the company had the power of eminent domain, including the right to survey their property and condemn it to build their pipeline. Sunoco hired a realty company to appraise the land, valuing the 23 acres at $352,000 and estimating the damage of constructing a pipeline at $2,700. Representatives offered the Coxes $6,000. They said it was better to sign an agreement immediately, since the company would gain the right to the property anyway. “I kind of thought, ‘If we resist enough, they’re going to go away.’ But they didn’t,” Cox says. The Coxes didn’t know it then, but their dream home lay in the path of a metastasizing controversy that involves not only Sunoco’s bid for eminent domain but an attempt by the company to circumvent local zoning laws, all aimed at swiftly completing a sprawling, multi-year project to exploit a boom in the byproducts of the Marcellus Shale. The Marcellus, a subterranean layer of flaky rock that extends beneath several states in the Appalachian Basin, has unleashed an unprecedented glut of natural gas that is reshaping energy production and consumption in the United States. The outcome of the battle over Sunoco’s plans promises to influence both the breadth and speed of that transformation. Sunoco Logistics Partners says it can invoke eminent domain to build a pipeline under private properties. What's behind the company's legal argument — and is it full of gas? Betting on rising demand for so-called natural gas liquids such as ethane, propane and butane, Sunoco Logistics Partners — which earned $16.6 billion in revenue in 2013 — has committed at least $660 million to the construction and retrofitting of hundreds of miles of pipeline and the rejuvenation of a dormant refining and storage facility that straddles the border between Pennsylvania and Delaware. The project is a cornerstone of future plans for the company, which became a subsidiary of Dallas-based behemoth Energy Transfer Partners in 2012 along with its old parent, Sunoco Inc., which is primarily involved in retail fuel sales, including its numerous gas stations. Sunoco Logistics Partners, which stores and transports much of the product sold by Sunoco Inc., faces rapidly escalating competition in the field of natural gas liquids. To speed its project, the company took the unusual step of petitioning the Pennsylvania Public Utility Commission (PUC) to affirm that it is a “public utility,” one of the few entities under state law that can use eminent domain, and for an exemption that would allow the company to bypass local zoning rules in the more than two dozen towns affected by the project. What it’s really going to turn out to be is the political muscle and political contribution muscle of the Marcellus Shale industry versus a larger and larger citizen protest, and I just hope the citizens win. Gov. Tom Corbett has been an advocate for the Sunoco pipeline project, though recently he has toned down his support. Sunoco’s aggressive strategy has prompted an uproar among communities along the pipelines, some of which have hired lawyers to intervene before the PUC, and among some state legislators, who have written letters urging the commissioners to deny Sunoco’s petition. The legal dust-up now threatens not only to derail aspects of Sunoco’s costly venture but to become a political football in a year when Pennsylvania will elect a new state House of Representatives, half of the state Senate and its governor. The incumbent, Republican Tom Corbett, has been an outspoken supporter of the shale gas industry and pushed legislation, known as Act 13, that attempted to weaken local control over gas production while establishing one of the lowest natural gas taxes in the nation. But the Sunoco controversy comes as statewide attitudes seem to be shifting against Corbett: The Pennsylvania Supreme Court struck down Act 13’s local zoning controls in December, and the governor now faces bipartisan calls to close a massive budget deficit in part by extracting more from gas producers through a new, higher tax on the value of their gas. Perhaps more importantly, Sunoco’s gambit for public utility status and the ensuing legal battle, which is likely to play out for months and could involve the state’s appellate courts, may determine whether other private energy companies pursue a similar strategy in the future, potentially accelerating the development that has already altered the physical and economic landscape of the country's gas-rich states. A Sunoco spokesman declined to comment, saying the company’s position is represented in its public filings before the PUC. In those filings, Sunoco has argued that it fits Pennsylvania’s definition of a public utility because of the way it is regulated by federal authorities, its past permissions to ship petroleum in the state and its tentative plans to keep a small portion of its gas in Pennsylvania. Though the Marcellus Shale was known to be a rich gas source for years, energetic exploration only began in earnest in the mid-2000s, when companies using new techniques for horizontal drilling and hydraulic fracturing (known as “fracking”) benefited from a laissez-faire state and federal regulatory environment to spark a boom in Pennsylvania. Two basic products are harvested from the shale: methane, which is what most Americans think of as natural gas, and natural gas liquids. In industry parlance, methane is known as “dry” gas, and the others as “wet” gas. As energy exploration companies began to use novel techniques in the mid-2000s, the Marcellus region witnessed a stunning rise in the production of natural gas liquids, which are used worldwide to produce plastics, heat homes and blend with gasoline. The federal Energy Information Administration maps U.S. natural gas production according to World War Two-era Petroleum Administration for Defense Districts, or PADDs. The graph below shows the how the production of natural gas liquids surged at gas processing plants in a sub-PADD known as Appalachian No. 1, which encompasses West Virginia and much of the Marcellus region in Pennsylvania and New York. Both propane and butane are widely used for domestic heating and cooking and industrial torches, and sometimes as motor fuel, in addition to other uses, while ethane — currently the cheapest of any gas — is the primary ingredient in the process that ultimately yields polyethylene, the world’s most common plastic. While an overabundance of dry gas has kept its price down for years, wet gas still enjoys a premium, which has pushed producers to expand their efforts to refine and ship it. Between May 2013 and April 2014, the latest month for which data is available, production of wet gas in the Marcellus region alone soared 262 percent, to 141,000 barrels per day, according to the federal Energy Information Administration, whose research suggests that growing foreign demand for ethane would push prices and production higher in years to come. Little of this likely surprised Sunoco Logistics Partners, which announced its pipeline project in 2010. It appears, in my perspective, a new and innovative effort for Sunoco to do what they’re trying to do here. Innovation can be good, but not at the expense of private property rights. Today, Sunoco’s venture has grown to include at least four existing or planned pipelines that are shipping or planned to ship wet gas across the United States, often to export terminals. Mariner East I, an eight-decade-old underground pipeline that once transported petroleum in Pennsylvania from east to west, is at the heart of the controversy. Under Sunoco's plans, the pipeline would be improved and reversed to ship 70,000 barrels of wet gas every day from Marcellus Shale wells to the 112-year-old Marcus Hook refinery and storage facility on the Delaware River. Sunoco Inc. idled Marcus Hook in 2011, but Sunoco Logistics Partners bought it and soon began retrofitting it for the Mariner project. Additionally, Sunoco began constructing an entirely new, 45-mile-long segment of pipeline to connect the old petroleum line to a refinery in the town of Houston, south of Pittsburgh, where propane, ethane and butane would be separated from methane. When it began picking up speed in 2012, Mariner East received words of praise from Gov. Corbett. But Mariner East has since turned into a headache. First, objections forced Sunoco to reroute the new connecting segment away from the Pittsburgh suburbs in Allegheny County. Then, as Sunoco began its attempts to use eminent domain, around two dozen property owners hired an attorney, Michael Faherty, to fight Sunoco in court. In eastern York County, where Sunoco sought to take property for an entirely new, unbuilt pipeline, Mariner East II, a local judge became the first to declare that the company was not a public utility, a ruling that Faherty has invoked in his cases on the other side of the state. In Faherty’s view, Sunoco’s tactics were an “abuse,” and the company’s threat of eminent domain, he says, convinced many people to sell access to their property at cheap rates. Today, Sunoco’s venture has grown to include at least four existing or planned pipelines, called Mariner West, Mariner South, Mariner East I and Mariner East II. Mariner West, which runs through Ohio and Michigan, began exporting ethane to Canada in December, and Sunoco expects Mariner South to begin transporting export-grade propane and butane to the Gulf Coast in early 2015. Mariner East II, not yet built, would run through Ohio and West Virginia and help move wet gas from western Pennsylvania to the east, but its fate could hinge on the outcome of the pipeline at the heart of the controversy: Mariner East I. 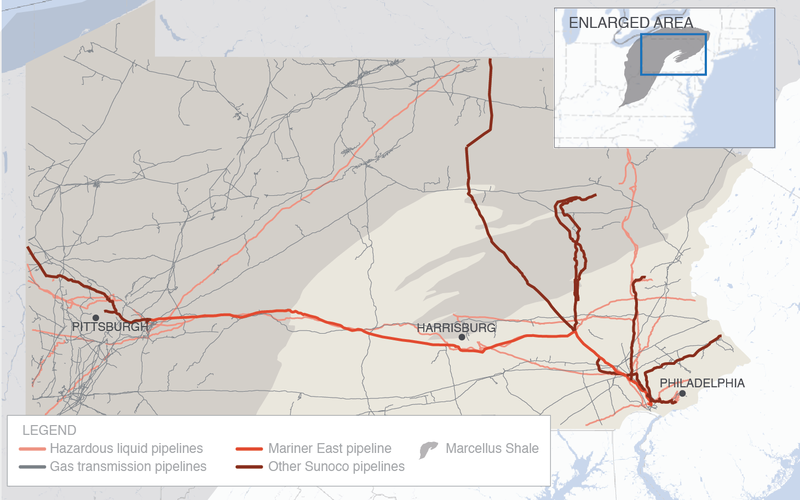 Under Sunoco’s plans for Mariner East I, an eight-decade-old underground pipeline that once transported petroleum in Pennsylvania from east to west would be retrofitted and reversed to ship 70,000 barrels of wet gas every day from Marcellus Shale wells to the 112-year-old Marcus Hook refinery and storage facility on the Delaware River. Since the mid-2000s, pipeline construction in Pennsylvania has continued nearly unabated, as companies seek to expand their infrastructure to keep up with growing local and foreign demand for gas products. Natural gas pipelines and others that carry wet gas, petroleum and other liquids — known as "hazardous materials" instead of "gas" — now branch throughout the state. Note: The pipeline locations shown in the map are an approximation. Maps of pipelines from the National Pipeline Mapping System can vary up to 10% from other sources. Not shown are the new 45-mile pipeline south of Pittsburgh that will feed natural gas liquids into Mariner East or the pipeline’s end point, at the Marcus Hook refinery and storage terminal on the Delaware River, just outside of Philadelphia. Sources: National Pipeline Mapping System Public Map Viewer; Sunoco Logistics NGL Projects; Marcellus Center for Outreach and Research. Residents of Chester County, a pipeline hub, have challenged Sunoco representatives at public meetings and successively lobbied local officials to oppose the Mariner East project. All but two of Faherty’s clients eventually agreed to settle with Sunoco — for amounts he declined to disclose — but the controversy set off by the company’s bid before the PUC promises to be a far longer battle. At its heart is affluent Chester County, in Philadelphia’s western suburbs. Chester County has so many pipelines — the third-most mileage of any county in the state, according to Sen. Dinniman, whose district encompasses much of them — that the local government has built a website to track their spread, including an interactive map that shows the pipes crisscrossing local towns. The county sits at a sometimes-overlooked nexus of Pennsylvania’s energy boom, a place where the gas that is fracked and drilled in the west ends with sale and export in the east. Unlike most states, Pennsylvania has no government agency empowered to regulate the location of pipelines, leaving such matters to local communities. The strongest opposition to Mariner East, which Sunoco’s supporters characterize as a “Not In My Back Yard” effort by misinformed residents, has developed in West Goshen Township, a community in Chester County which until a recent redistricting fell in Dinniman’s district. There, Sunoco plans to build a pump station, one of 18 the company says it needs to construct along Mariner East’s statewide path to keep the gas in the pipeline under enough pressure that it stays in liquid form and flows steadily. The station would include a 30-foot-tall tower, sometimes called a “flare stack,” to burn off excess gas if the highly pressurized liquids revert to their natural, gaseous forms due to low pressure or during repairs. At its heart is affluent Chester County, in Philadelphia’s western suburbs. Chester County has so many pipelines — the third-most mileage of any in the state, according to Sen. Dinniman, whose district encompasses much of them — that the local government has built a website to track their spread, including an interactive map that shows the pipes crisscrossing county townships. Unlike the majority of states, Pennsylvania has no statewide body to regulate the location of pipelines, leaving control in the hands of cities and counties. You’re hitting families in two places: their family’s safety and their biggest investment, their home, and when you read that [Sunoco] ha[s] bigger and bigger plans, that makes it even scarier. Energized by spreading opposition to the project, residents have organized themselves into multiple groups, including the Concerned Citizens of West Goshen Township and the Chester County Community Coalition, to challenge the pipelines. Yard signs urging neighbors to “Say no to Sunoco” pepper front lawns in the leafy neighborhood surrounding the proposed pump station. Town meetings attended by Sunoco representatives in recent months have devolved into angry shouting matches. “You’re hitting families in two places: their family’s safety and their biggest investment, their home, and when you read that [Sunoco] ha[s] bigger and bigger plans, that makes it even scarier,” says Lilli Middlebrooks, a lawyer and former chemical engineer who has helped organize the groups. Unlike the petroleum that once flowed through the pipeline, Middlebrooks says, wet gas is only a liquid when kept under high pressure. If ethane or propane leaked, she says, they would form colorless vapor clouds too heavy to be dispersed easily in the wind, which would be vulnerable to sudden ignition. Such events, though rare, have previously struck natural gas and gasoline pipelines. Most recently, in 2010, a natural gas pipeline owned by Pacific Gas and Electric exploded in San Bruno, California, killing eight people and injuring 66. Federal investigators determined that different segments of the pipeline had been held together with defective welds that broke as the company increased pressure over the years to keep up with consumer demand. Pacific Gas and Electric has since been charged in federal court and is also the subject of an investigation before the California Public Utilities Commission. That is the scenario that Middlebrooks and others fear. “I think they want to get their products to market and they’re just trying to figure out the best way to do it,” she says. Several hundred residents packed the West Goshen Township Zoning Hearing Board meeting in April to discuss the pipeline and pump station. Where Sunoco Logistics Partners intends to market its wet gas has been a matter of contention. In the past, Sunoco and its partners have spoken plainly about their desire to export natural gas liquids, but as the opposition to the Mariner project grew, Sunoco pledged to keep some of its propane in Pennsylvania. Lawyers for Sunoco’s opponents have argued that the change in strategy is nothing but a ruse meant to bolster their case for being a public utility and, ultimately, give them the power to avoid local regulation. In the months after the Mariner East project began, both Sunoco and Range Resources, a Texas-based drilling company that has agreed to provide 40,000 barrels of gas per day to Sunoco, said they expected to ship at least half of their wet gas to hungry markets in Europe. Range signed a 15-year contract with INEOS, a Swiss petrochemical producer, for its ethane. But after the wave of resistance this spring, Sunoco appeared to shift its strategy. The company dropped its legal team, from the Harrisburg-based firm McNees Wallace & Nurick, and hired new attorneys from Philadelphia-based Blank Rome. The new lawyers filed an amended petition in May, pointedly stating that Sunoco now intended to ship at least 5,000 barrels of propane per day — roughly 7 percent of the project’s capacity — to a destination in Pennsylvania before it reaches the Marcus Hook refinery and export terminal. The change in plans was aimed at meeting “heightened demand…that arose from severe supply shortages” over the past winter, Sunoco wrote. But lawyers and other Sunoco critics have dismissed the promise as a meaningless gimmick, not least because they doubt that the Mariner pipelines could siphon propane out of the liquid gas mix that early in the process, before reaching the terminal. It also seems likely that export remains on Sunoco’s mind. During a conference call with financial analysts in early May to discuss Sunoco Logistics Partners’ first-quarter performance, CEO Michael Hennigan said that a new plan by a competitor to build an ethane plant in Texas "shows that ethane is gonna export from the Gulf Coast" and reinforces "the thesis that we've been saying, [which] is that the barrels that are up in the Marcellus and Utica [shales] should really get to the European and Asian markets at the closest possible port.” Sunoco’s plan to pipe wet gas to its facility at Marcus Hook was a competitive way to do so, he said. There is both actual conflict of interest and there’s an appearance of potential conflict of interest. Though the dispute over exports may matter for appearances, it remains to be seen if it will sway the members of the PUC, which itself has been the subject of criticism. In late May, Chairman Robert Powelson, a Corbett appointee, left an energy lobbying group after a local National Public Radio affiliate raised questions about the appearance of bias. Powelson had belonged to the Greater Philadelphia Energy Action Team, which is chaired by the CEO of an oil refinery and aimed at expanding energy and petrochemical manufacturing. Another member of the Energy Action Team, former Department of Environmental Protection chief Michael Krancer, is a partner at Blank Rome and one of the lawyers representing Sunoco before the PUC. Before Powelson stepped down, the chair of the Energy Action Team wrote to the PUC expressing support for the Mariner East project. Even Gov. Corbett’s office seems to have toned down its enthusiasm for the project. Half the people said they’re going to take the money and move. One went to Alaska. In western Pennsylvania, the pipeline’s path has churned up a dirt tract dozens of feet wide through former pasture across the road from the Coxes. In June, the path had halted across from their property, but not for long — they decided to settle with Sunoco. The pipeline will run up the hill under the Coxes’ woods before making a right turn, running for another 162 feet, making another right turn and heading off their property. Workers are already digging at a distant property where the pipeline will pick up. In western Pennsylvania, the pipeline’s path has churned up a dirt tract dozens of feet wide through former pasture across the road from the Coxes. The path halts across from their property, but not for long — they have decided to settle with Sunoco. The Pipeline and Hazardous Materials Safety Administration, a division of the U.S. Department of Transportation, places materials into two categories: hazardous liquids, which includes ethane, propane and butane, and gas. It defines a "significant incident" as one that involves any of the following: a fatality or injury; $50,000 or more in total costs measured in 1984 dollars; a release of at least five barrels of highly volatile liquid or 50 barrels of any other liquid; or a release that results in a fire or explosion. The PHMSA has recorded data on hazardous liquid incidents in Pennsylvania since 2004. Though there have been no casualties associated with such pipelines in the state, spills have caused more than $37,000,000 in property damage. The costliest incident on record in Pennsylvania occurred in 2005, when an underground gasoline tank operated by Buckeye Pipeline Company broke due to a faulty weld, releasing more than 40,000 gallons and causing more than $18,000,000 in damages. Buckeye has a troubled history in Pennsylvania: In 1990, a landslide ruptured one of the company's pipes and sent a mix of gasoline, diesel fuel and heating oil into the Allegheny River, threatening the water supplies of Pittsburgh and other cities. Source: Pipeline and Hazardous Materials Safety Administration; New York Times. The PHMSA has documented significant national incidents since 1994. The costliest incident in its records occurred in 2010, when a corroded segment of an oil pipeline operated by Enbridge Energy ruptured, spilling its contents into the Kalamazoo River and causing more than $812,000,000 in damages, the most expensive on-shore spill in U.S. history. The year 2004 was the most recent to see more than 20 casualties: Five men died and four were injured in Walnut Creek, California, when they punctured a poorly marked high-pressure Kinder Morgan gasoline pipeline while installing a water main. Source: Pipeline and Hazardous Materials Safety Administration; National Transportation Safety Board; San Francisco Chronicle; California State Fire Marshal.